Other Common Names: Hu huang lian (China), titka kul (Ayurvedic), picrorhiza, kutki, katuka, kutka (Hindu, Sanskrit), kadu (Gujarati). 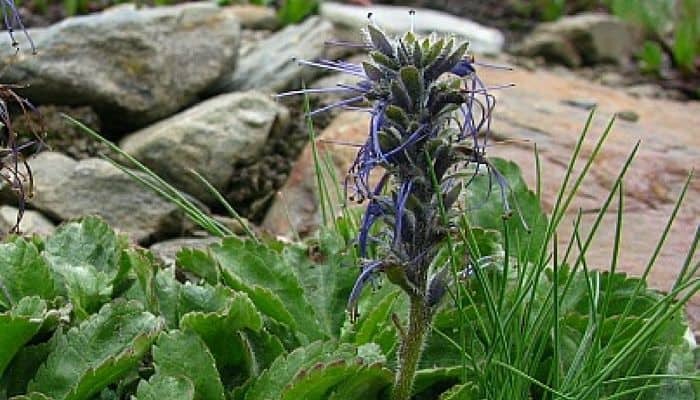 Habitat; Picrorhiza grows in the hilly regions of the North-Western Himalayan region from Kashmir to Kumaun and Garhwal regions of India and Nepal. It is found at 3,000 – 5,000 meters (7-14,000 feet) of elevation, growing in rocky crevices and moist, sandy soil. 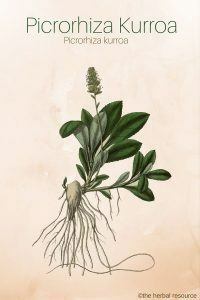 Plant Description: The bitter-tasting roots of Picrorhiza kurroa are hard, about 6-10 inches in length, and creeping. The leaves are 2-4 inches long, oval in shape with a sharp apex, flat, and serrate. The flowers are white or pale purple on a long spike, blooming in June through August. The fruit is a ½ inch long and oval in shape. The rhizome of picrorhiza is manually harvested in October through December. Like many species of medicinal plants, picrorhiza is threatened to near extinction due to over-harvesting. Plant Part Used: Leaf, bark, root and rhizomes. 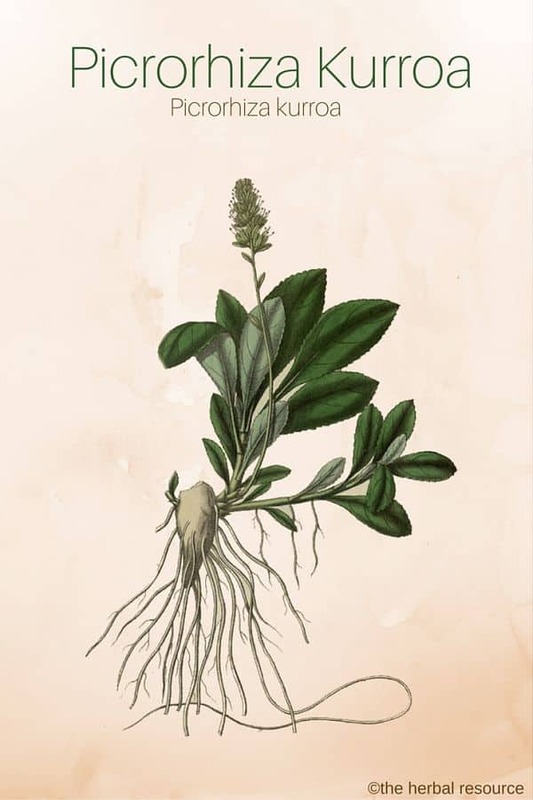 The root contains a number of very bitter glucosides including kitkin and picrorhizin, nine cucurbitacin glycosides, D-mannitol, benetic acid, kutkisterol, vanillic acid and some steroids. The actions of the herb are antibacterial, antiperiodic, cathartic (in large doses), laxative(in smaller doses) stomachic and bitter tonic, hepatoprotective, anti-cholestatic (relieves obstruction of bile salts), anti-inflammatory, anti-allergy, antioxidant; modulates the immune system and liver enzyme levels. Picrorhiza kurroa is an important herb in the traditional Chinese and Ayurvedic systems of medicine, used to treat liver and upper respiratory conditions. Its traditional uses include treatment of a wide range of conditions, including fevers, chronic diarrhea, constipation, dyspepsia and jaundice. 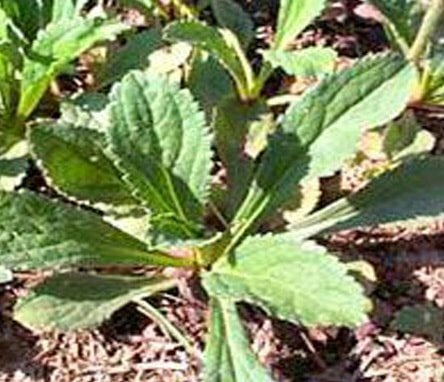 Picrorhiza kurroa is traditionally used to treat disorders of the upper respiratory tract and is thought to be beneficial as an herbal treatment for bronchial asthma. Animal studies have shown that the herb has a powerful antioxidant and anti-inflammatory effect. It has also shown that the active constituents of picrorhiza kurroa may prevent liver toxicity and the ensuing biochemical changes caused by numerous toxic agents. In other animal studies, picrorhiza raised depleted glutathione levels in rats infected with malaria, boosting detoxification and antioxidation. The herb is thought to be helpful as a remedy for a number of auto-immune diseases such as vitiligo and psoriasis. Research also indicates that picrorhiza kurroa may be of therapeutic value in treating viral hepatitis and that some constituents of picrorhiza kurroa may protect against liver damage due to Amanita mushroom poisoning. Studies have shown that the curcubitacins in the herb are highly cytotoxic and have antitumor actions and that it may reduce blood cholesterol levels and reduce coagulation time. Furthermore, studies of the rhizome were shown to boost the immune system and to have a specific action against the parasite Leishmania donovani, which causes the tropical parasitic disease called leishmaniasis. Picrorhiza is a traditional herbal treatment for scorpion stings and snake bites. Picrorhiza does not easily release its components into water, therefore it is not usually taken as a tea. It is mostly administered as a standardized (4% kitkin) encapsulated powder extract. Typical adult dosage is 400 – 1500 mg/day, with dosages up to 3.5 g/day sometimes recommended for fevers. 3-4 gm is recommended as antiperiodic. 0.6-1.2 gm as a bitter tonic. Picrorhiza root extracts are widely used in India with no adverse effects being reported. It is essential to consult a professional healthcare professional when altering any medications and it should be thoroughly investigated how herbal medications may interact with each other or with conventional medication. Medicinal herbs may produce side effects or carry some element of risk, although side-effects and risks are generally less common and serious than in synthetic drugs. Any applicable precautions and contraindications should be clearly understood. Carefully research and select a reputable source when buying medicinal herbs, and always read the label for ingredients, instructions, and warnings.